Swappers choice! 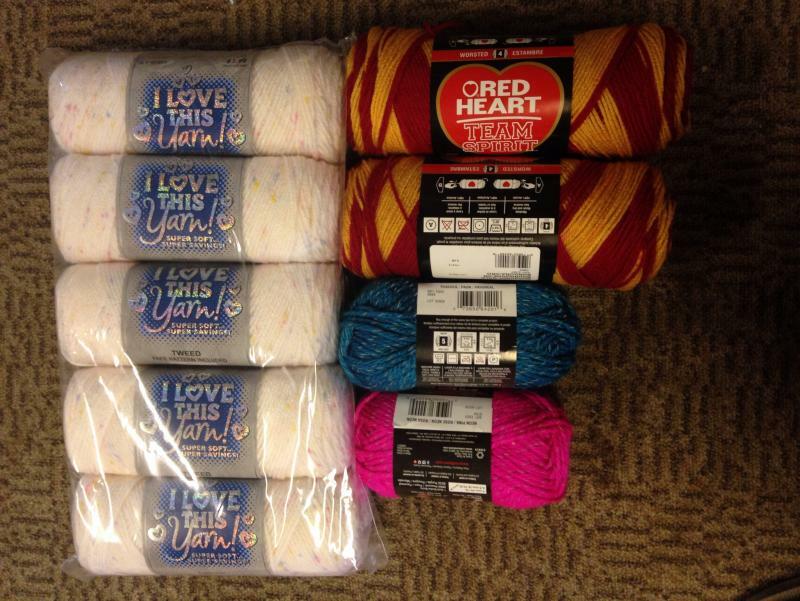 Specify what yarn, what colors, and let your partner spoil you. The total value of your package must equal $25, which does not include shipping. You may include additional items based on your partner’s survey and emails, and don’t forget to stalk their Wish List for other ideas. Remember: Crochetville admin limits Villagers to two swaps at one time. If you are already signed up for two swaps, one must be completed before the Yarn Swap starts for you to be eligible to swap. See the Swap Guidelines. A swap will count as completed if you have mailed your final package and delivery confirmation information shows your package has been received OR your swap partner has posted a thank-you in the swap thread. 1. Please submit a survey if you want to participate in this exchange. (See second post for Survey information.) Surveys should be emailed to the swap coordinator, auntbubbels at nyc dot rr dot com. Please list the swap name in the subject line. You will receive a confirmation email when your survey is received, and your username will be added to the list of swappers posted below. Surveys can be submitted until noon Eastern zone DST (New York City) on 29 June 2014. 5. E-mail the coordinator, auntbubbels at nyc dot rr dot com, when you receive your partner information at the start of the swap, and when you send and receive your exchange item(s) so that she can keep record of who sent and received. This is in addition to posting to the swap thread that you mailed or received your assigned partner and your packages. Lots of messages are posted to the swap thread daily. Please don’t make the swap coordinator go through all those messages to see if you sent/received your package!!! Remember, these emails are now required of all Crochetville swappers. Failure to do so will result in the accumulation of reputation points. 6. 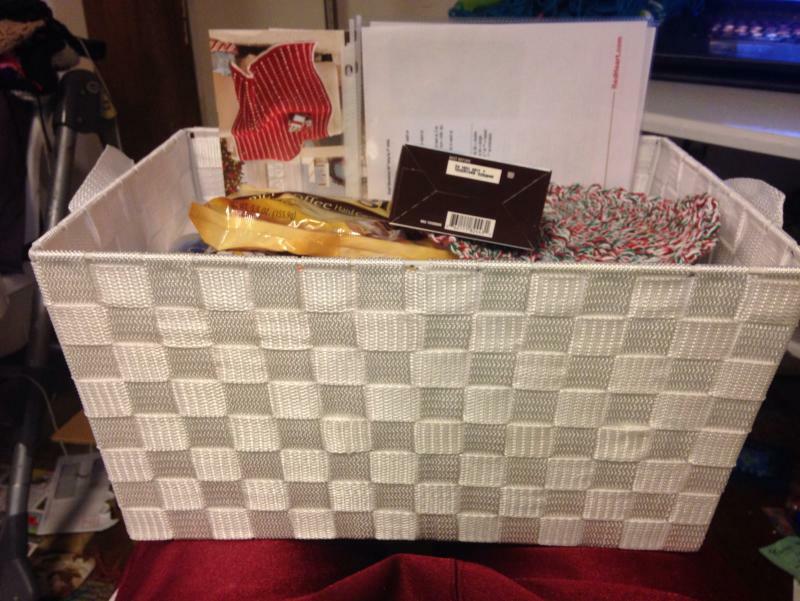 Please thank your partner for their thoughtfulness when you receive your package. It will make his or her day. **Thank-you’s MUST be posted on the swap thread, but you can post links to your blog for photos, etc., if you choose. Thank-you’s are REQUIRED!! ** Please also thank your partner personally with a private email, as well as a post to the swap thread. The private thank-you lets your partner know that their package has been received, and the public thank-you lets the other swappers know what you received and adds to everyone’s enjoyment of the exchange. Both public and private thank-you’s are required. 7. Make sure your postage and receiver's address are correct before mailing. Mark your package with Crochetville Yarn Swap. Do not forget that delivery confirmation (or other proof of shipping) is required whenever it is available, and the delivery confirmation must be emailed to the swap coordinator. This provides proof of mailing in case your package is lost during transit. Delivery confirmation is now standard with first class shipping. Please email your surveys auntbubbELs at nyc dot rr dot com. You will receive a confirmation email that your survey has been received. All swappers will be listed on the first post. 4. What is your complete mailing address? 5. Can you send to a foreign partner? 7. Do you or anyone in your household smoke? 10. What are your favorite colors? Please be specific. 11. Are there any colors you don't like? 12. What sort of items would you like to receive? 13. Are there items that you do not wish to receive? 14. Are there any crochet or fiber art items that you particularly enjoy receiving? 15. What other crafts besides crochet do you enjoy, if any? 16. 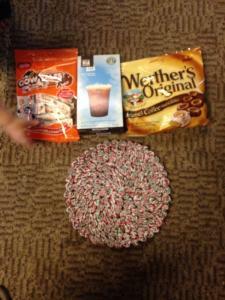 Have you participated in a swap at C'ville before? Which ones? 17. Are you currently participating in any swaps? Which ones? 18. What extra goodies do you enjoy? (Tea, coffee, cocoa, etc. — these aren't required items for this swap, but this info is useful if your partner wishes to send some extras). 19. Have you read all of the swap rules, both for this specific swap and the Swap Guidelines? And do you agree to follow these rules? 20. Anything else you want your partner to know? I just sent in my survey! I wish I had the money for this swap, I've been wanting to do this swap for a while. It looks like it may end up just being you & me! LOL...thank you Janet! I'm sorry I didn't respond yesterday, but I spent the day sewing and never checked my email! Getting ready to email Jessica now! Holly and i have been emailing!! The shopping has started!! Can't wait I will be getting some goodies while on vacation next week also! 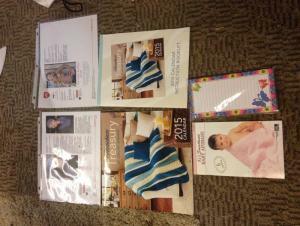 I receives my package from Holly yesterday!!! I got a year of afghans calendar, a pamphlet with all the instructions for those afghans, a book with 5 baby blanket patterns & 2 printed patterns and a butterfly notepad. 6 skeins of ILTY yarn in pastels and some red heart reflective in hot pink and peacock. 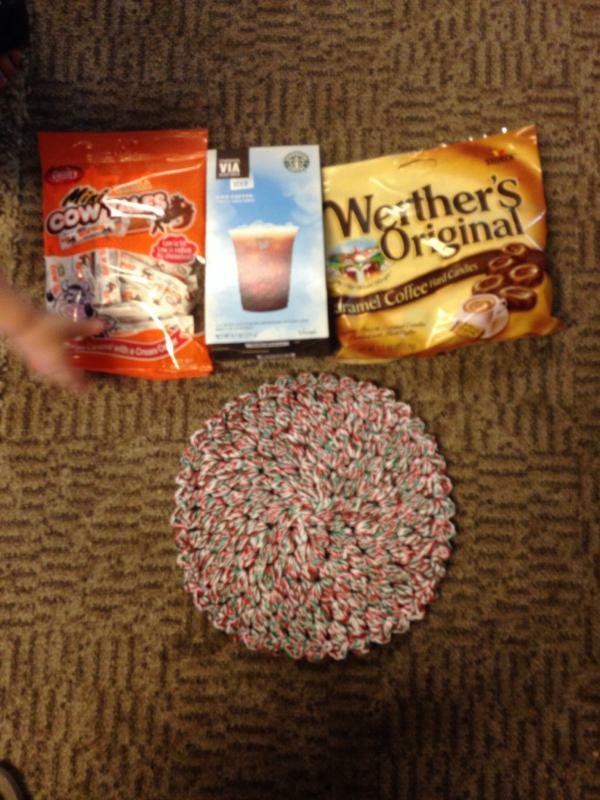 Pack of mini cow tail candies and some caramel werthers candies some Starbucks iced coffee packs and a dish cloth. Oh!! And they all came in a beautiful weaved basket!! I think that's it. I'm on the road but will look through the pictures since they're on my phone! Oh Jessica....I'm so happy you like what I sent to you! No new grand-daughter yet...she's due in three weeks, but I'm on standby to head out to El Paso. Safe travels to you! Yay! Tracking shows my package was delivered yesterday! I'm in El Paso right now, but will be driving home to Fort Worth tomorrow. I can hardly wait! What a weekend! I got home safely from El Paso on Saturday and asked my husband where he'd put my package, to which he replied "what package"? We've lived here for 14 years and never had a package removed from the porch! But, not to worry...the mystery was solved! I waited for my mailman to show up on Monday, and we discovered he had placed the package in the mailbox...but, he'd forgotten to put the key to get it out into my mailbox. I couldn't be too angry though....he's a very nice man. 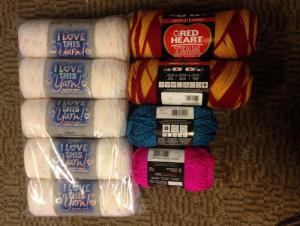 I'm happy to say that Jessica sent me a box "bursting at the seams" of ILTY "and" Caron's Simply Soft! So, I'm Happy, Happy, Happy! Thank you so much for being my partner! I had fun!! I hope you are able to get more use out of the maroon CSS than I was! I just coulnd't get that yarn to cooperate with me! Enjoy the ILTY! !